Much of the composition of this painting was influenced by an earlier work of the Northern artist Rogier van der Weyden. The relationship between figures, space and the viewer’s standpoint, the high horizon, slightly raised viewpoint, space receding into the far distance, and a central figural group poised before a rock formation in the middle of the landscape are all copied from van der Weyden's Entombment of Christ (1460, Uffizi Gallery, Italy). Owing to the painting's unfinished status in 1481, the commission was handed over to Filippino Lippi, who painted another Adoration of the Magi, completed in 1496, in substitution of the one commissioned to Leonardo. It is housed in the Uffizi in Florence. Domenico Ghirlandaio completed a separate painting, expanding upon Leonardo's theme, in 1488. In 2002, Dr. Maurizio Seracini, an art diagnostician alumnus of the University of California, San Diego and a native Florentine, was commissioned by the Uffizi to undertake a study of the paint surface to determine whether the painting could be restored without damaging it. Seracini, who heads Editech, a Florence-based company he founded in 1977 focused on the "diagnostics of cultural heritage", used high-resolution digital scans as well as thermographic, ultrasound, ultraviolet and infrared diagnostic techniques to study the painting in ultra-fine detail. He concluded that the painting could not be restored without damaging it and that Leonardo only did the underdrawing. Another artist (or artists) was responsible for all of the existing paintwork on top of the underdrawing. 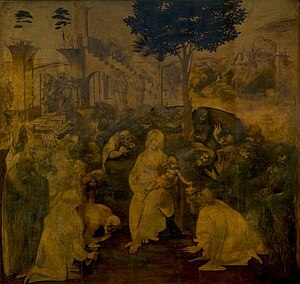 Seracini stated that "none of the paint we see on the Adoration today was put there by Leonardo." As a part of his diagnostic survey on the Adoration of the Magi, Seracini completed more than 2,400 detailed infrared photographic records of the painting's elaborate underdrawing, and scientific analyses. The new images revealed by the diagnostic techniques used by Seracini were initially made public in 2002 in an interview with New York Times reporter Melinda Henneberger. In 2005, nearing the end of his investigation, Seracini gave another interview, this time to Guardian reporter John Hooper. Seracini finally published his results in 2006: M. Seracini, "Diagnostic Investigations on the Adoration of the Magi by Leonardo da Vinci" in The Mind of Leonardo – The Universal Genius at Work, exhibit catalogue edited by P. Gauluzzi, Giunti Florence, 2006, pp. 94–101. In the Smithsonian Channel TV program, Da Vinci Detective, Seracini conjectures that, upon seeing the preliminary drawings for the altarpiece they had commissioned, they rejected it due to the sensational scenario presented to them. Fully expecting a traditional interpretation including the three wise men, they were instead confronted with a maelstrom of unrelated, half-emaciated figures surrounding the Christ-Child, as well as a full-blown battle scene in the rear of the picture. They chose instead to relegate it to a storage house, rather than to destroy the original work. It was only much later, and probably in the context of the subsequent rise in value of Leonardo artworks, that it was resurrected and painted over by unknown persons to make it more "sale-able." This later re-working of the panel resulted in alterations to Leonardo's original design for the piece. The Uffizi Gallery has recently completed a six-year restoration of the work. It has been fully cleaned with years of dirt and old varnish removed. The result is a work that is incredibly bright, with Da Vinci's charcoal outline and marks clearly visible. The wood panels have also been restored, ensuring the stability of the work for generations to come. ^ full presentation Archived September 28, 2007, at the Wayback Machine by Florence.tv that shows Leonardo's underdrawing discovered by Seracini. ^ "Leonardo Adoration of the Magi – Times Article". Library.thinkquest.org. 2002-04-21. Archived from the original on 2012-10-17. Retrieved 2013-07-17. ^ John Hooper in Rome (2005-09-20). "report". London: Guardian. Retrieved 2013-07-17. ^ "Structural Engineering, University of California San Diego". Structures.ucsd.edu. Retrieved 2013-07-17. Costantino, Maria (1994). Leonardo. New York: Smithmark. Wikimedia Commons has media related to Adoration of the Magi by Leonardo da Vinci.